Habib Bank Jobs 2019, Lahore Karachi Islamabad Apply Online for HBL jobs for Fresh Graduates. 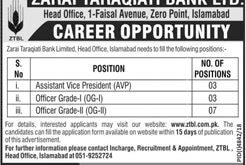 Jobs in HBL Habib Bank Limited are available and currently, HBL is looking to hire staff for all branches of HBL across Pakistan. How To Apply for HBL Jobs 2019? Applicants meeting criteria should apply via online at the official site of HBL or through web link given above.